The Freetoo Motorcycle Gloves are a very low cost glove which is probably why they’re so popular. Unlike most motorcycle gloves these gloves are in fact suitable for other activities as well as motorcycling. These gloves are highly adaptable meaning that they are suitable for most outdoor operations such as driving gloves, hunting gloves, batting gloves and so on. The gloves come in 3 different colors which is always nice to have a little choice. In addition to this there is also the option to have the gloves fingerless. Although this obviously isn’t suitable for motorcycling if you were planning to use the gloves for another purpose it’s an interesting option to have. At first glance the Freetoo Motorcycle Gloves are incredibly good value for money given their extremely low cost. They appear to be a very minimalistic glove with some protection while aiming to maximize the ability to be precise. After a good first impression these Freetoo Gloves certainly didn’t let me down on comfort and dexterity. Freetoo has made the gloves with a breathable stretch nylon material making them a really nice fitting and comfortable summer glove. The material is also incredibly lightweight and fast drying if they do get wet or are washed. What I like in a glove is for it to feel nice on the skin so it’s not a chore to wear them and they certainly succeeded in that. The interior of the glove is nice and soft making the glove overall really comfortable to wear and the stretch nylon gives them a near perfect fit. As the gloves are an incredibly thin summer glove they don’t restrict movement in the slightest and so a lack of dexterity will never be an issue with these gloves. Using controls on a motorcycle was extremely easy with these on and operating zippers, buttons and electronics was just as easy. Given that these gloves are a summer glove heat retention isn’t an important issue but whenever I review a pair of gloves that aren’t necessarily meant to keep your hands warm I then focus my attention to the gloves ability to keep the hands a comfortable temperature. As a summer glove they performed well at temperature regulation thanks to the breathable stretch nylon that they are made from as well as the breathable air holes on the knuckles which allows air to run through the gloves freely. This works really well to keep your hands at a comfortable temperature no matter how warm it is. They have no water resistance but when they cost such a small amount would you really expect them to? Probably not. Although the gloves do have a water related feature in that they are quick drying meaning that if you’re caught out in rain they won’t keep your hands dry but they will dry quickly. Which for a glove in this price bracket is a nice little feature. For a totally waterproof glove in a similar price bracket you should have a look at this pair. For a glove that costs as much as the Freetoo Gloves you might be worried about the quality of the protection they provide and to be honest I was skeptical at first too. But the gloves feature a small selection of pretty decent quality safety features. Firstly there’s the fact that despite the thickness of the gloves I found them to be pretty versatile and robust making them unlikely to rip. The knuckles have a good covering of plastic protection which isn’t quite as tough as carbon fiber but still very helpful in the event of a crash. In addition to this the palms are reinforced in order to protect against abrasion. The fingers also have additional material for protection against abrasion or injuries. Overall the Freetoo Motorcycle Gloves have a decent small array of safety features. They don’t have anything special but for the price this is to be expected. If you could afford it I’d probably want a glove with more protection but really whether this glove is for you or not comes down entirely to cost. For how much these Freetoo gloves cost you cannot complain about their quality. The stretchy nylon they’re made of makes them incredibly comfortable and really breathable which is perfect for a summer glove. Given the price, I’d say the gloves are faultless. The protection is average at best but definitely sufficient which in my opinion overall makes this one of the best budget gloves around. 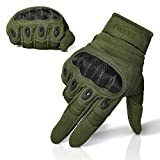 Whether you intend to use it as a motorcycle glove or for any of it’s other uses I would definitely recommend these Freetoo gloves to anyone looking for a decent very low priced glove. It’s no surprise that these are one of the top selling pairs of gloves on Amazon. 1.Cycling Gloves, (Men cycling Gloves, Women cycling Gloves, Kids cycling Gloves) 2.Weight Lifting Gloves,3.Summer Gloves,4.Winter Cycling Gloves,5.motorbike Gloves,6.motorcross Gloves,7 MMA Gloves,8.Batting Gloves,9.Golf Gloves,10.Horse Riding Gloves,11.GoalKeeper Gloves,12.Cross country Gloves. We have been an established and popular company with an excellent track record for the best customer satisfaction. We have never compromised on the quality and the services provided to the customer.We have highly Skilled Labor. We believe in keeping the customers happy and providing them with products at a very competent price. Please feel free to Write us & keep in touch with us about any of your business related requirements/queries. Please Visit our website. for Broad Range of our products. We would like to offer our service to your company. Thank you for the information. I’ll keep this in mind in the future.